AUSSIE-developed rescue product among finalists for prestigious design awards. The SOS Rescue Ladder developed by local marine rescue specialists, SOS Marine, has been short-listed for this year's 25th Design Award METS (DAME) held in conjunction with the METSTRADE show in November. The short list of 51 new marine products has been selected from 108 entries from 92 companies in 24 countries submitted to the prestigious competition this year. The Recovery Ladder has been short-listed in the lifesaving and safety equipment category. This is the fourth safety product in recent years from SOS Marine that has been accepted to go forward to the final judging. According to SOS Marine, the ease of use and comprehensive capability to save a life are the reasons why the Recovery Ladder is a worthy candidate for the DAME award. The two-in-one multi-function design of the ladder enables it to perform two types of recovery using the one product. The rungs can be used as a ladder or the entire shape can be used to lift a victim horizontally, parbuckle recovery style. 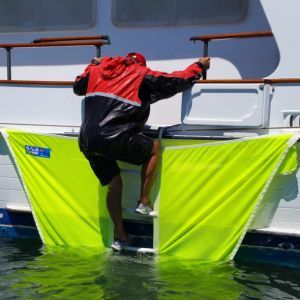 Unlike typical boarding ladders, the 'soft' design of the mesh boarding ladder with lightweight rungs is designed not to injure the victim when the boat rolls. “The key to the ladder is the four attaching points which provide greater security and stability. It is suitable for both sail and power vessels with up to 6 foot topsides-water to gunwale,” said a company spokesperson. SOS Marine develops safety and rescue equipment for 12 national defence forces worldwide. The company will be exhibiting in the Australian Pavilion at the Marine Equipment Trade Show (METS), stand 11.726 at RAI Amsterdam from 17-19 November.